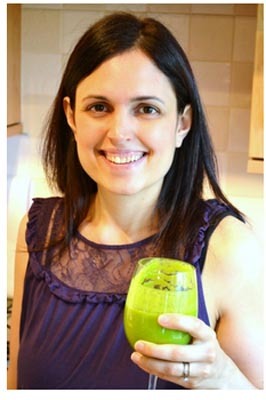 The Green Smoothie 7 Day Detox Diet Plan is sold as a series of downloadable books in PDF format. That’s convenient, as you can download them immediately after purchase without having to wait for delivery. You can read these books on any computer device, including your phone, if you’re so inclined. None of these bonuses are essential; a lot of that material is also covered in the main book. Still, it’s handy to have printable versions of the recipes, as the versions in the book have a lot of photos, and that would waste a lot of paper when it came time to print. The shopping list is also covered in the book, but the PDF standalone version is a bit easier to work with, especially if you want to print it out for a trip to the store. The key to the Green Smoothie 7 Day Detox Diet Plan is the “Green Thickie,” which is a meal replacement smoothie that author Katherine Kyle says she worked out on her own. In the diet, which is supposed to last 7 days, you’ll replace breakfast with a smoothie each day. Lunch can consist of another smoothie, or a baked potato and a salad. Dinner can be pretty much anything you like, within reason, though the book includes some great recipes for dinner meals. The Green Thickie smoothie is the key to the entire Green Smoothie 7 Day Detox Diet Plan, so if you don’t like smoothies, you can probably dismiss the Green Smoothie 7 Day Detox Diet Plan right now. The smoothie that you’ll have for breakfast each day consists of fruit, green leafy vegetables, some sort of liquid, such as juice or milk, and a “filler,” which could be any one of a number of things, including avocado, grains, oats, or bananas. The filler is critical for meal replacement, as that part is the part of the Green Smoothie 7 Day Detox Diet Plan that’s going to allow you to feel full after you drink the beverage. Each of the smoothie recipes is gluten free and free of animal products. 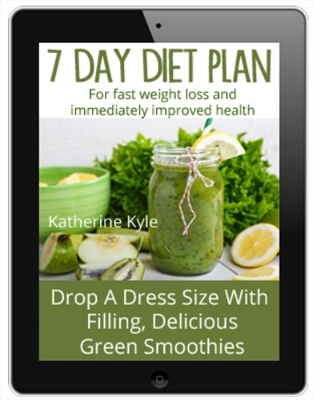 The Green Smoothie 7 Day Detox Diet Plan is supposed to be a complete meal replacement, though Ms. Kyle suggests that you will need some dietary supplements if you’re going to try the diet for more than a week. The Green Smoothie 7 Day Detox Diet Plan provides general instructions for creating Green Thickies, and then there are specific recipes for each day of the 7 days of the plan. While you’ll have a green smoothie for breakfast (and lunch, too, if you like,) the recipe for each day will be different. Kyle recommends that you prepare the smoothie the night before, especially if you’re using oats or a grain, such as quinoa, as a filler. You can make it the night before and keep it in the refrigerator until breakfast. All of the recipes, including those for the Green Thickies, are easy to prepare and use ingredients that you should be able to find at your local grocery store. The Green Smoothie 7 Day Detox Diet Plan gives a good description of the items that you’ll need for preparation, such as a good blender or food processor. She provides links to purchase them if you don’t have them already. 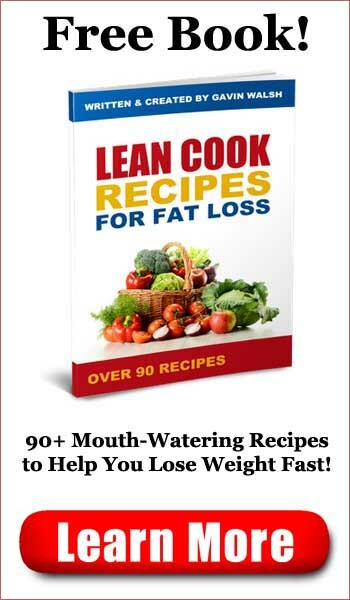 The book is well written and includes lots of color photos, and Kyle says that this is the diet she used to lose weight before she got pregnant and again after she had a baby. In both cases, she lost more than 40 pounds. Her Green Thickie Website is fairly popular, and has several thousand pages of content, so she must have a lot of fans. 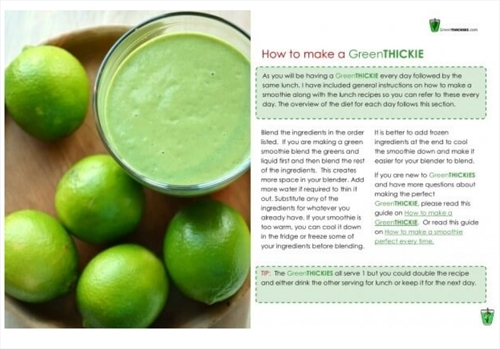 All in all, the book is easy to follow, and the Green Thickie recipes appear to provide a nutritious, filling meal replacement. If you follow the book as written and add some exercise to the mix, which the author recommends, you’ll probably see good results from the Green Smoothie 7 Day Detox Diet Plan. If you’re looking for a diet plan that’s relatively simple, nutritious, and easy to follow, I think Green Smoothie 7 Day Detox Diet Plan is likely a good fit for you. If you need to eat meat or don’t like smoothies, especially green ones, then this diet may be a poor choice. The book is well written, the instructions are easy to follow, and you’ll find all of the ingredients that you need for these smoothies at your local grocery store. 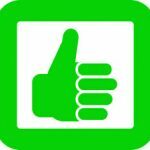 All in all, Green Smoothie 7 Day Detox Diet Plan is a pretty good product, and I recommend it. 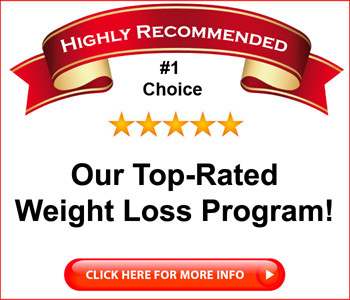 Click here to visit the Green Smoothie 7 Day Detox Diet Plan Website.